I am sooooo tired! This was a long looooooong day filled with yummy food and great times. I ate some pieces of an Italian Hero, they were tiny so I had 3 in total (and 2 more just now). 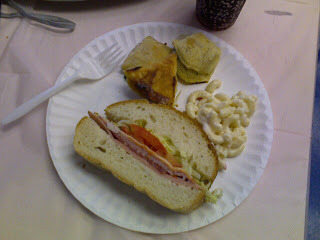 I also had some finger foods, macaroni salad, and a small piece of Carvel Cake. The party was great except for when my niece fell down and got a bloody nose. I almost fainted AND I started to cry when I saw her in pain, as you can see I am very attached to her. My sister gave me a goody bag which I just finished while I watched Law and Order =). 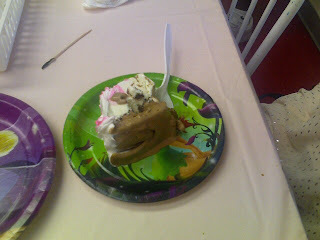 It was filled with Starburst and mini chocolate candy yuuuums. OMG me too!!!!! I was the "bloody nose girl"
wow, you really do love your niece! you commented on my blog that you don't fight with your sis for too long because you love your niece...that makes me wonder if I'll have such an affection for my niece and nephews in the future as well! EE HEE HEHH HEE!!! 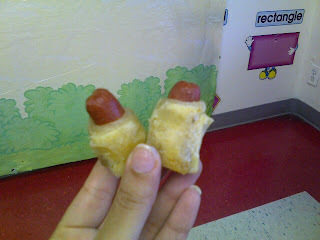 LOVE the mini hot dogs!